Convene is happy to be taking part in the virtual book tour Maddie Grant, CAE, and Lindy Dreyer are doing to explore concepts from Open Community: A Little Book of Big Ideas for Associations Navigating the Social Web. in In this post, Maddie and Lindy answer a few questions for Convene‘s readers. Lindy: Well, the community forming online around your organization (and your meeting!) is bigger than you may think. That’s an opportunity and a challenge. So, what is “Open Community,” and what role does it play in the success of a meeting? Lindy: Here’s the gist. Your Open Community is your people who are bonded by what your organization represents and care enough to talk to each other (hopefully about you!) online. Connecting with and supporting your Open Community is really important, because if you don’t, someone else will. Maddie: In the event community, we sell the importance of face-to-face and the kind of deep networking that happens at our meetings. Naturally, the idea that someone might be able to form a deep bond online was met with some skepticism at first. Over the last few years, that initial skepticism has transformed into optimism. Now the question is, how do we connect online with face-to-face in meaningful ways? How do we connect online with face-to-face? Does the book address that? Maddie: Haha. Not exactly. 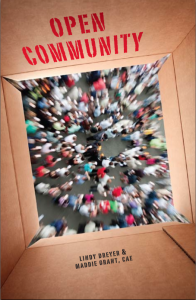 The book focuses on how organizations can build capacity for using social tools to connect with and support their Open Community. One of the biggest challenges that event professionals face is the cyclical nature of events. Your Open Community may only be engaged with your meeting during a short time-period immediately before, during, and after the event. Yet, they’ll be out in their own spaces, connecting in their own ways all year round. When your work to build community starts and stops along with your convention marketing cycle, you lose the connections. Lindy: Right, so if your organization builds the capacity to continue establishing and nurturing relationships all year round, the meeting will become the centerpiece of that thriving community for a natural time period. It happens in context with the bigger picture. Maddie: We’ve seen too many events running social media campaigns that are isolated from their organization’s social media. Why? Because organizations were behind the curve, and their conventions’ needs couldn’t wait. No more. It’s time to get the whole organization on the same page. How is your convention building community online? Are you coordinating with other social media efforts in your organization? What’s your strategy for connecting with and supporting your Open Community? Is it working?